In this episode of The Secret Golf, Steve Elkington takes viewers inside of his home on wheels, aka "The Big Show", talks with driver Craig Stevens, and visits Anderson Mobile Estates to discuss how it was made. FEMALE NARRATOR: On this episode of The Rural Golfer, we take all access tour of Elk's home away from home. RON ANDERSON (VOICEOVER): Double decker golf wagon. STEVE ELKINGTON (VOICEOVER): Four times bigger than the biggest bus on the road. CRAIG STEVENS (VOICEOVER): Because it is so unique, the only way to explain it, it's just a top line luxury RV. -We call it the Big Show, because there's no other way to describe it correctly. I'm able to live in it, while we're playing on the tour. And I get to do the same thing. I've got my own sheets. And I've got my own place I can cook. -He has really done a heck of a job inside that trailer. You know, it is beautiful. And that is Elk. -When you come home from golf, you got to have a big shower. Had to have a booth. Love booths. I put my gold putters back here. I have a little putting green there. I think just having the nice things that you're used to having when you're at home. I think that's more important on the road than anything, to be honest. FEMALE NARRATOR: The Rural Golfer is headed your way. -(SINGING) One, two, three, four. We got the Big Show revving and riding on the map. Where we're going next we just can't say. So grab your clubs. Let's hit some balls. We're making friends and playing golf. the Rural Golfer's coming your way. MALE NARRATOR: Luxury, sophistication, craftsmanship, practicality, and quite literally, tons of style. Welcome to the world of luxury RVs, where multi-level trailers in this elite club are among the most advanced mobile estates made. With that welcome to the Big Show. STEVE ELKINGTON (VOICEOVER): We call it the Big Show, because there's no other way to describe it correctly. It's just the Big Show. MALE NARRATOR: For years, the ground the Big Show has covered has resulted in the most spectacular sights around, from Niagara Falls to the wild wild west. One of the most elegant modes of transportation, this impressive abode travels everywhere. STEVE ELKINGTON (VOICEOVER): People love this unit. I'm going to be interested to see what they think about my trailer when I roll through some of these rural towns. MALE NARRATOR: As impressive as it is to look at, the specs which comprise the thing, are equally as heavy. STEVE ELKINGTON (VOICEOVER): We got the Big Show. And we love it. MALE NARRATOR: 75,000 pounds, 80 feet long, 13 and 1/2 feet high, and 1,200 square feet is Elk's home away from home. STEVE ELKINGTON (VOICEOVER): Maybe someday we'll go and, you know, up onto a river, or somewhere, in Alaska, or somewhere, and just nestle right up to a lake, or whatever, and just catch fish and hunt bears, or something. Maybe. No, I couldn't do it. I couldn't kill a bear. MALE NARRATOR: Unlikely as it sounds, the path of a driver from the world of rock and roll intersects with that of a PGA tour pro and forms quite the unique relationship. -Golf's unusual, that we rely heavily on people like drivers. -Elk and I met through the company that built the unit. And they approached me about this job they had coming up with a golfer. And so I said, yeah, I'd be interested. And from the first time I met him we just-- we hit it off. And we, like, just became fast friends, spot on. 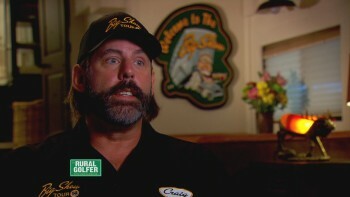 MALE NARRATOR: His ability to gracefully maneuver massive manners on wheels made Craig the ideal man for the job. -What I do here on the Big Show is I drive, set it up, maintain it, get it all ready for the week. I'll get there, usually, Sunday afternoon. And I'll set up Monday morning. Parking the Big Show usually entails me calling ahead of time for the operations manager and figuring out a spot. And a lot goes into that. You've got to be able to get satellite, water, that sort of thing. To fully set the Big Show up, it's very important that the unit has to be perfectly level, because if it's not, when the roof goes up, it's going to tweak and bend. Then, we start with the process of putting the slide outs out. And then, check the level, again. And then, I'll go out and raise the roof on it. It's probably a good two, two and a half hour set up to get it fully ready to go. STEVE ELKINGTON (VOICEOVER): He's great at what he does. But he has a lot of experience. You know, he's been with a lot of bands, handled a lot of trucks. CRAIG STEVENS (VOICEOVER): I've spent 25 years in the rock and roll business. I did 10 years driving tractor trailers with various artists. STEVE ELKINGTON (VOICEOVER): Not everyone's great at what they do. But he's great at what he does. -Guys, come around to this side. And you can grab the ladder. STEVE ELKINGTON (VOICEOVER): It takes a pro to do that. -In one half mile, take exit 115. -We go from tournament to tournament. And I get it already. And then, Elk, kind of flies in. I give him the head's up. And he'll come in, within a couple hours. And we're set up for the week. In rock and roll, we were moving-- you're moving every night, every other night. Golf, you go set up and you're in towns for a week on end. -He's been around a lot of eccentric people. Not saying that I'm eccentric. But I'm saying he's been around a lot of people that have a lot of needs. -I'll take that one lemon. And give the rest of the other guys. CRAIG STEVENS (VOICEOVER): This is just not a driving set up routine. That's just part of the job. When I came on, it wasn't part of me to cook. But I'm not bad in the kitchen. So that's kind of evolved. STEVE ELKINGTON (VOICEOVER): I don't think I'm that hard to manage. But we enjoy ourselves. -Our personalities really meld well together. And since we've been doing this run, I swear I've known Elk for 15 years. -It's one of these relationships you have, like a caddy, where you're just out there together and shooting the breeze at the Big Show and playing a little golf. CRAIG STEVENS (VOICEOVER): After the Big Show is fully set up, on the inside, we have this racing tent, that, if you've ever seen NASCAR or any of the races, they all have these tents where they work on their cars. And that's what we have. To fully set this up, we're talking another four or five hours. It's a long day of working. It looks beautiful set up. But the process is it's a challenge, to say the least. STEVE ELKINGTON (VOICEOVER): I didn't know that I was going have a tent out there, where you could host parties and all that. And then, my sponsor, Insperity, said, we love this. Let's have some people over here, because everyone wants to go into someone's locker room, so to speak. -Look how pretty that is. Because seriously. -I hate hotels. After being on tour for 25 years, I mean, there's nothing worse, to me, than getting my meal underneath a steel tray, or a glass that has plastic over it. I mean, it just drives me crazy. I'd seen a show on TV that Will Smith had this exact trailer that he had as a set up, as like a recording studio. He was using it when he was filming Men in Black, in New York City. So I wrote down the name of the company and I checked it out. MALE NARRATOR: Elk turned to Anderson Mobile Estates to turn his mobile mansion dream into reality. -I called the guy up and said, hey, you know what's this all about? Because I saw it was really nice and everything. And he said, well, Elk, I'll bring one out. And you can have a look at. And I said, OK. Let's do it. Came back and told my wife, I said, you know what? This would be the way to go. I can do it on the Champions Tour, because we know that we're going to be there the whole week. It's not as much pressure as a regular tour week. We don't have any more cuts. So we play each day. And we know I'm coming to Birmingham Tuesday, I'm leaving Sunday. So we can get really set up here. -You know, it's been the funest build we've ever done. Oh my god. I mean, Elk is just-- Elk is Elk, you know? MALE NARRATOR: Welcome To the Big Show. 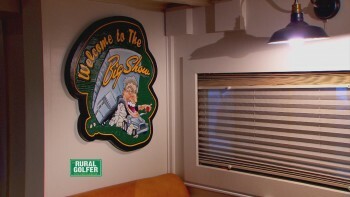 At nearly 1,200 square feet, the Big Show offers spacious living, with all the luxury comforts of home. -It's really difficult to describe the Big Show, because it is so unique. And there's very few of these units. And each one of the units that are in existence are very unique. So the only way to explain it, it's just a top line luxury RV. There's nobody else that does a two story RV. And when you explain it to somebody, they really don't grasp the magnitude and the size of this thing. It has a huge footprint. And once people are on it, then they realize, wow, it's nothing like any picture or any video you've ever seen. And you see it in person and it's just, you step back and go like, wow, this thing's amazing. -It kind of designed itself. The fridge had to go somewhere. And then, the stove had to go somewhere. Had to have a booth. Loves booths. And then, sponsors love it. And I host parties in here. And at the same time, I'm able to live in it while we're playing on the tour. And I get to do the same thing. I got my own sheets. And I got my own place I can cook. And today we are in Alabama. And it's pouring down rain. I just walk right off the golf course. Boom. Right back in here. MALE NARRATOR: And after a long day on the course, one thing is always on Elk's mind. STEVE ELKINGTON (VOICEOVER): When you come home from golf, you got to have a big shower, got to have a great shower. So that had to be in there. So I put all these wishlists into Anderson Mobile Estates. And this is what came out. -He just contacted me. And we worked it out. And we made something that worked. It was a market we wanted to go into. And he was the perfect starting point. CRAIG STEVENS (VOICEOVER): The downstairs has all been done by Restoration Hardware. We have a 55 inch high Def TV. There's two couches that can double as beds, if we have some guests over. The booth is Texas branded cowhide, which you actually can see the brand marks in it. And six adults can sit comfortably. -I don't know if I could have pulled this off when I was on the regular tour, just because it might have been too flashy, or too big, or something. But, man, I'm 51. What's it matter what I'm doing, really? I mean, I'm enjoying myself. MALE NARRATOR: When he's looking to really kick back, Elk often migrates the master suite for a little downtime. -I'm up at 5. But I'm down at 9 at night, you know? And when I'm down, I'm down. So I gotta have a good spot. CRAIG STEVENS (VOICEOVER): There's a TV hidden in a cabinet on a lift It's a queen sized bed, Tempur-Pedic. MALE NARRATOR: And when it's time to entertain, Elk heads back downstairs where he and Craig have crafted a shared passion into a centerpiece for the unit. -Steve and I have worked for the last year on building, like, the ultimate bourbon bar. -He got me hooked on collecting bourbon, which, you know, I've had worse things that I've collected. But-- and we like to sit them up there and make them look pretty. And we go to towns and maybe go and look at a distillery and maybe pick a bottle that we don't have. CRAIG STEVENS (VOICEOVER): In the back of the trailer, we have the putting green. -I put my gold putters back here, that I won all my tournaments with. We have a little putting green there. That's fun. CRAIG STEVENS (VOICEOVER): It's all the creature comforts of home. And this is a home on wheels. -Jerry Barber and all them held their putter right here. They held their putter in their hand. Jerry Barber, always before he putted, he went here. And he always put his putter here. Now, what Jackie did was, he matched these hands, right here. This hand and this hand. Now, when you turn it over, it's so open. It's so open. See that? -Now, what Corey does, Corey he's over here. And his face stays open, stays open, stays open, stays open. Never closes, ever. Well, Jerry Barber, easily the greatest putter of all. He always went like that. Wiped his hand there. Set his wrist. And now, it's way open, right? Now, if I do the flip-- Craig Foster flip there, it can't get closed. It's impossible. You can't close it. MALE NARRATOR: What customers see, a revolutionary, one of a kind, Anderson Mobile Estates, which had become the norm in the custom trailer arena. -OK. This unit is called the Heat. It's a little bit different flavors than the others, and a little bit different flavor than Elk's. Never as quite as cozy and homey as Elk's. But let's take a look and I'll show you around. In this particular situation, we have a kitchen set up on this side of the couch. And again, it's not an elaborate kitchen, like Elk's. It's just a basic kitchen. But we have your sink here. And your dishwasher drawer down here, which is just perfect for the size things that we want to use and do in an RV like this. Then, you have your cooktop and your convection microwave. And then, of course, your big refrigerator/freezer on the side. Now, on this side, we have a little bit of a neat feature here. This makeup mirror pops up, right out of here. Now, one other feature is that we also have a TV that plays right through this makeup mirror. Comes right, you know, so you can either have it on, or have it off. Now, let me show you this bathroom. And one of the unique things about this bathroom is that this is also a steam shower. It's so nice to come in here at the end of the day and just relax and just feel the warmth of that nice steam shower. Now, another thing we did that's unique in here is this is all open to natural light. We have frosted glass on top of this ceiling in this bathroom to allow natural light to come in here. And then, we have the regular sink. And your regular RV-style high pressure toilet in here also. OK. So as we come into this room, you'll see that we have-- on this side, we have a large desk. And then, on this side, we have a couch that actually converts into a hideabed. So this pops out and makes into a bed. And then, we have this large area back here, which is just an air handler area that we designed. We eventually have, down on other units, we've made that into a full bedroom, right there. Now, as we spin around the other way, and take a look here, you'll see that we have a nice 50-inch TV overhead here. And then, we have this desk. And at this desk, you can actually tie your computer right into this TV so that whatever's on your computer screen actually plays on this TV screen also. Now, in this room, we also have high velocity, high pressure air conditioning system that we developed for this. So by doing the method that we used on this, we can actually get a 50 degree differential outside the inside air temperature in here, which is pretty much unheard of. Well, the unit I'm going to show you right now-- all of our units have names, and this one is called the Studio. So let me take you inside. It's a little different flavor inside of here than Elk's. So let's take a look and we'll show you some differences. This one we set up as kind of the new modern look. You know, the all white book and the highest tech that we could possibly get in here? Everything in here is all touchscreen. There's no actual buttons or switches. Everything is on a touch screen. So what you can do is, if you want, you can actually just pick this panel up and take it with you. It will actually undock itself, right out of the wall. And you can just pick it up and make whatever you want to work. We can build these units in the anything that you want. Basically, you're starting with 1,200 square feet. And whatever you want to do, and whatever your dream is, we'll make it happen. MALE NARRATOR: But Ron Anderson didn't stop there. Driven by the belief that there need be no limits, the future of custom designed motor homes is here, with their triple decker. -OK. Well, I'm going to take you through one of our new three-story trailers. And there's only two of these in the world. And you're going to see the second one of them. You kind of got to get to a level where you're in production, you know? And that's what's finally came around with the three-story trailer. As you can see, this is raw. This is bare bones. This unit is all trust built. You've got to build this thing structurally. And by an engineer trust situation, you have the strongest environment. It took a lot of engineering. And it took a lot to restructure it. This trailer only weighs 35,000 pounds, the way it is right now. But we're limited to 80,000 pounds. We cannot exceed 80,000 pounds. So this gives us the ability to give our clients more, by having the ability to go with more weight. Our other trailers have weighed 45 to 50,000 pounds, before we start. So this gives us the ability to give our clients more. A couple of other things. These windows, what we've done is we used a special glass for this. And then, these are thermal. On the outside edge of this, you see how I put my finger right in behind this. So this inner peace of glass floats. And that's what allows this roof to bend and flex and go up and down without breaking the windows out of it. Now, let's go up to the coup d'eva here. And this is our third level deck. Your feet are 18 feet off the ground here. So you're up on top of the world right here. And as you can see, this space goes back. And all of this folds right down into the roof. You don't have to carry anything up here. You pull these five pins. This thing drops and lays down right into the roof. Back here, we cut it a little bit short, for another reason, as this is where we put our solar panels. Because the way we build our units today, we can run these units strictly off of solar power, except for heat and air conditioning. So what we've created an environment that's like their home and triggers that little part of their brain that says, I'm home. This is where I can relax. That's what gives us that edge over the other guy. MALE NARRATOR: From the headlights to the taillights, the Big Show is packing up and headed out, certain to turn more heads as it rounds more corners on down the road. FEMALE NARRATOR: On the next episode of The Rural Golfer. -This facility oozes history. When you walk on to the premises, you just smell it, touch it, feel it. FEMALE NARRATOR: Elk heads to San Antonio, for a Texas size history lesson. -We had two historical things going on here, for 20 years, where we had men that changed the shape of the world in golf, playing right here. FEMALE NARRATOR: Where he learns a little bit about golf and makes a monumental discovery. -You're telling me that Borglum sculpture design first rendition of Mount Rushmore was done here in the shadow of the flagstick? FEMALE NARRATOR: And also manages to find some time to squeeze in a good old fashioned putting match. -We play this game named stymie. -I never have played a putting match where I got to have strategy. -If somebody's in front of you, that's too bad. You've got to figure it out.